Mary Vesta Williams (December 1, 1957 – September 22, 2011) was an American recording artist and songwriter, who performed across genres such as pop, jazz, adult contemporary and R&B. Originally credited as Vesta Williams, she was sometimes simply billed as Vesta beginning in the 1990s.She was known for her four-octave vocal range.Although Williams never had any albums certified gold nor any Top 40 hits on the Billboard Hot 100, she scored six Top 10 hits on the United States Billboard R&B chart from the mid 1980s to the early 1990s. Williams was known for the hits “Once Bitten, Twice Shy”, “Sweet Sweet Love”, “Special”, and her 1989 hit and signature song, “Congratulations”. 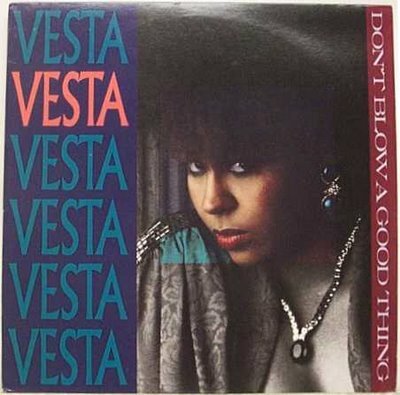 The third single to be released from Vesta’s debut album was “Don’t Blow A Good Thing” , the track hit #5 on the US Dance Charts, #17 on the US R&B and #89 on the UK single chart. The 12″ was mixed by Steve Thompson & Michael Barbiero.